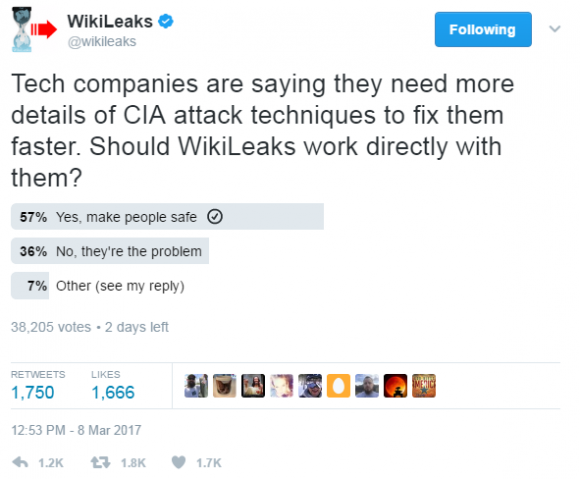 When WikiLeaks on Tuesday dumped thousands of files documenting hacking tools used by the U.S. Central Intelligence Agency, many feared WikiLeaks would soon publish a trove of so-called “zero days,” the actual computer code that the CIA uses to exploit previously unknown flaws in a range of software and hardware products used by consumers and businesses. But on Thursday, WikiLeaks editor-in-chief Julian Assange promised that his organization would work with hardware and software vendors to fix the security weaknesses prior to releasing additional details about the flaws. So-called “zero-day” flaws refer to vulnerabilities in hardware or software products that vendors first learn about when those flaws are already under active attack (i.e., the vendor has “zero days” to fix the vulnerability before it begins affecting its customers and users). Zero-day flaws are highly prized by cybercriminals and nation states alike because they potentially allow attackers to stealthily bypass a target’s digital defenses.